Around the same time as I started this blog I also switched into a new area in my team at work. I’m once again faced with the struggle and joy of learning new things at work, this time in understanding factor risks also called styles. So the new role is spending less time meeting brilliant fund managers and more time on analysis. But I did learn a lot from all the great investors I met and I would like to share some thoughts. As everyone interested in the field of finance, I read a tremendous amount of financial news stare at stock charts, etc. I also dedicated a lot of my time both for a Msc in Quant Finance and later a CFA. But the deeper I delve into Finance there more I get the feeling how incredibly much there is left to learn. When I still was in University I was a more confident investor than I am today, when I today know probably 10 times as much. We all know examples of extremely clever people, still making huge mistakes in investing, maybe the most famous one being Long Term Capital. You can be one of the world’s best at company valuations, knowing all the ins and outs of a balance sheet but still makes big mistakes. Investing requires you to be a master of so many fields, it’s more or less impossible for a single person to be all that. We can see how people try to handle this by narrowing the universe of what they are looking at, for example only one country or one sector across countries. Another way to slice it, is to become a master of an investing style. Many bloggers and investment professionals focus on one style, for example Small-caps, Value, others look at Growth, and some try to combine styles for example GARP (Growth At Reasonable Price), small cap Value etc. Other skip companies and invest more through Macro views, or given the low interest rates, Quality companies and High Dividend strategies has gained popularity. I have also seen a trend (hehe) more recently of Momentum investing gaining traction also outside of the CTA/Trend-following hedge fund space. All these styles requires tremendous effort to master fully – and I’m sure nobody is master of all. In essence, the more knowledge you gain, the larger the chance is that you can skew the odds in your favor and generate alpha. It’s a never-ending learning journey where curious knowledge seeking people can express their knowledge into investment ideas – and potentially reap the rewards. I think that is the core of why I love working in and with Finance. I have still not reached the stage where I found my “style”. But I don’t want to rush it. I feel a lot of people for example read about Buffet and Munger’s success in investing and then they just decide – I want to be a value investor. They then gather up all great written books about Value investing with the mindset of, I want to learn to become a great Value investor. But they never really gave for example Growth investing the same chance to shine. They did not have a good picture of what the different investment styles had to offer, they already plunged in and decided Value investing is my thing. Well maybe it is, but for me personally I want to spend a few more years understanding both stock markets around the world, different sectors, as well as different investing styles. Because if it’s one thing I learnt from meeting all these great managers out there, with great track-records of alpha generation – there is not one style that is superior to others, all different styles of investing can work, if you do it right. And maybe as important, different investing styles will outperform during different times. We all know the story of how people laughed at Buffet around year 2000, and how his Value investing style came back with a vengeance when the bubble burst. In the spirit of learning more I have spent a larger part of the weekend reading up on different blogs, and also watched a fair amount of material on Youtube. Internet truly is a marvelous place for all us knowledge thirsty people. I wanted to share some good material I have come across. 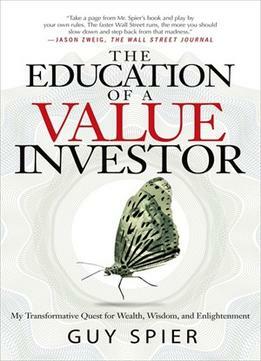 I recently read a book by Guy Spier called The Education of A Value Investor. I read it after a recommendation from the blog Value and Opportunity. I found the material resonated a lot with my own thinking, that the markets are currently a bit crazy, pricing FANG stocks (Facebook, Amazon, Netflix, Google) and others like Tesla at crazy multiples. We are in something of a new Nifty-Fifty scenario – and I don’t like it (since I don’t do shorts).